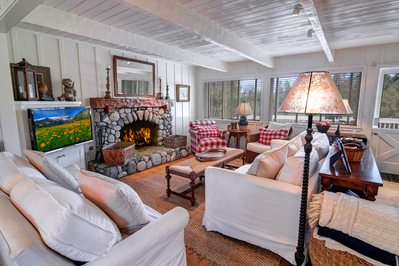 Living Area: 1,572 Square Ft.
Classic Tavern Bay Area Cottage ! EMOTIONAL 1,572 SQFT CLASSIC LAKE ARROWHEAD COTTAGE TRADITIONAL! ALL THE BELLS AND WHISTLES ON THIS GREGG IMUS REMODEL ~ DECORATOR PERFECT ~ PINE FLOORING ~ BEAMED CEILINGS ~ STONE COUNTER TOPS ~ FARM APRON SINK ~ STAINLESS APPLIANCES. SUNNY NORTH SHORE TAVERN BAY LOCALE ~ PRISTINE ONE OF A TRIPLE TAVERN BAY DOCK # N-310-A is included ~ 15,000 SQFT PRIVATE WOODED LOT ~ WOW!